After my post earlier this week on creating current day/week/month/year reports in Power BI a few people asked me for a more detailed explanation of the way I was creating tables without using a data source in my M code. 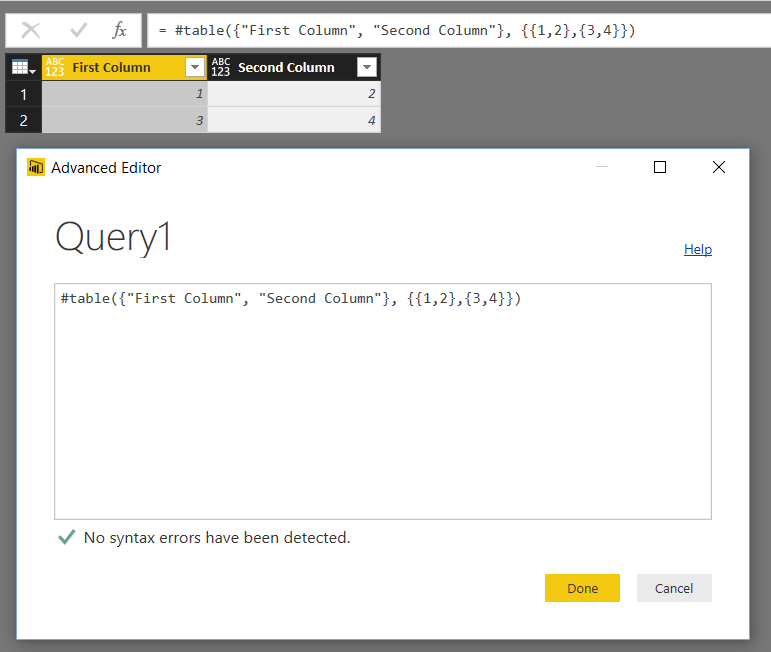 This is something I find myself doing quite a lot when I’m loading data with Power BI and Power Query, and while there are several ways of doing this I find that using the #table() intrinsic function is the most elegant option. No data source is needed – this is a way of defining a table value in pure M code. The first parameter of the function takes a list of column names as text values; the second parameter is a list of lists, where each list in the list contains the values on each row in the table. In this example the first parameter is no longer a list of column names but a declaration of a table type that not only has column names in but also column types. You can see from the icons in the column headers in the screenshot above that the column called “Number Column” has a data type of number, “Text Column” has a data type of text, and “Date Column” has a data type of date. Of course if you need a fixed table value in Power BI you could use the “Enter Data” button or, if you’re using Excel and Power Query you could create an Excel table and then use the Excel.CurrentWorkbook() function to load the contents of it; if you or your end users need to edit the values in your table easily then you should use one of these two options. On the other hand if you don’t want users to be able to edit the values in the table or, more likely, you are generating the contents of your table using functions that return lists (as in my previous post) then #table() is the way to go. No let expression needed, and a lot less code. Awesome tips for creating the table “Last Refresh”, thank you. No, there is no reliable way you can store historical data in Power BI. You have to use an external SSAS model or use Direct Query on a relational database if you want to do it. Would this be a way to pull a typed data table from a URL that responds with contents in the #table format? No, I don’t think that would work – #table() takes two parameters, and this example only has one so it would error. I don’t even think it’s possible for a Web.Contents() to return anything that can be recognised as a table on its own. Ah, ok, I understand. Yes, I guess that would work although I think you’d need to have some extra code to treat what Web.Contents() returns as text. Why would you want to do that though? Wouldn’t it just be easier to, say, create an OData data source that returned the same table? Creating an OData feed involves implementing metadata semantics. LOTS of code. PITA. This would be much easier. 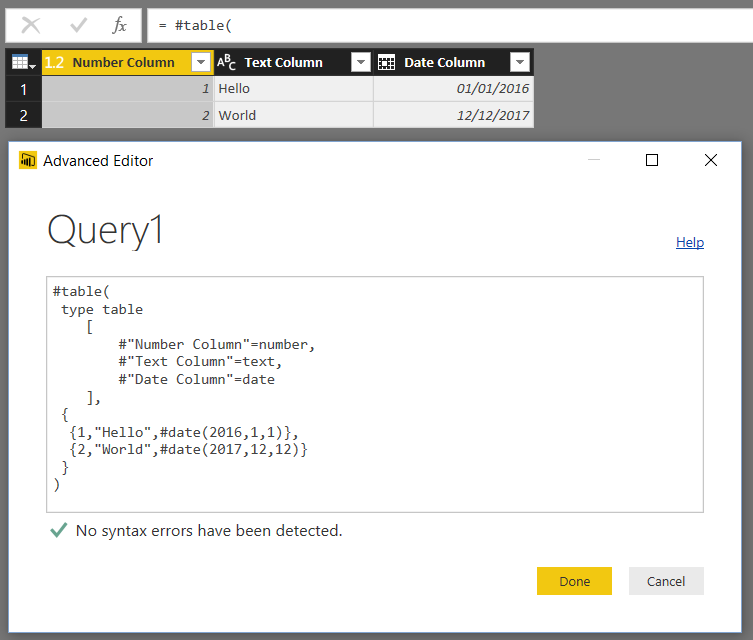 Power Query M doesn’t have generic way to pull structured data besides OData, so your post made me think #table() could be an elegant solution. I would also be worried about using Expression.Evaluate() because, in theory, a hacker could inject any code they liked into your query and cause all kinds of problems! Maybe a more realistic objection is that if you read Curt Hagenlocher’s comments on this post https://blog.crossjoin.co.uk/2014/02/04/loading-power-query-m-code-from-text-files/ you’ll see that using Expression.Evaluate() could result in performance problems. Two valid points indeed. Really just wish that Power Query had a way to pull structured data. Good old Excel Web Queries (IQY) could do this, but I see no way in Power Query. What I’ve been doing is to have an M generator. It generates M that includes setting the column data types for JSON returned from Web.Contents(). In your previous post, you provided the following code for the calendar table. It needs a starting date and a number of dates. I wonder if we could do the same thing using the ending date instead of the number of dates. Actually, your code uses 750 days and then you were missing the last day of 2016 since there is a 29-Feb-2016, namely 2016 has 366 days. Of course you could replace 750 by 751, but It is not that elegant. I’ve personally never been a fan of using List.Dates for this for the leap year reason. My preference is to create a list of values, then convert them to a table and transform them into dates. Because you specify the start/end, leap years are auto-magically included where appropriate. To be honest, that code was something I put together quickly to get some dates into a table – I wasn’t expecting anyone to look at it too closely, sorry. In fact when I really want to create a date table I use something more like the CreatePeriodTable function in that post that does take a start and an end date, finds the number of days between them using Duration.Days() and then uses that instead of a hard-coded number of days. Hi Chris, thanks for your post. Just wondering, are there any other “intrinsic functions” such as #table, and where are they documented? It looks like there are #date, #time, and #duration as well, but these are just hinted at in the documentation on MSDN. Is there a way I can generate a calendar table function with monthly increment rather than day. I only want to have month, quarter and year columns in it. I have created a calendar table with consecutive dates, removed date column, then removed duplicate entries. While I achieved the structure I wanted, is there a better, cleaner way of doing it? Yes, there will be a cleaner way of doing this with some relatively simple M code. However if you have already got something working I’m not sure it’s worth the effort to write the new code if you’re not comfortable with M.
table1 = table1 + raw2…. No, because values in M are immutable. What you can do is create a new table with the new rows in (I guess what your raw1 and raw2 represent), and use Table.Combine (https://msdn.microsoft.com/en-us/query-bi/m/table-combine) to combine the data from the original table with the new table. Thanks for a quick reply Chris, even if the answer is not what I was hoping for. To clarify, I was hoping there is a way of using M to insert raw permanently to an existing table, but obviously its not the case. You’re right, it isn’t possible in M. There are some hacks to do this (eg this old post of mine: https://blog.crossjoin.co.uk/2013/05/13/accumulating-data-in-an-excel-table-using-data-explorer-and-powerpivot/) but they are very hacky. The only reliable way of doing this is with Power BI’s incremental refresh functionality which for now is only available with Power BI Premium but which will, eventually, be in Power BI Pro too. Well, it’s nice to be able to make a table. But how can I give it a proper name to then use its fields in a report? 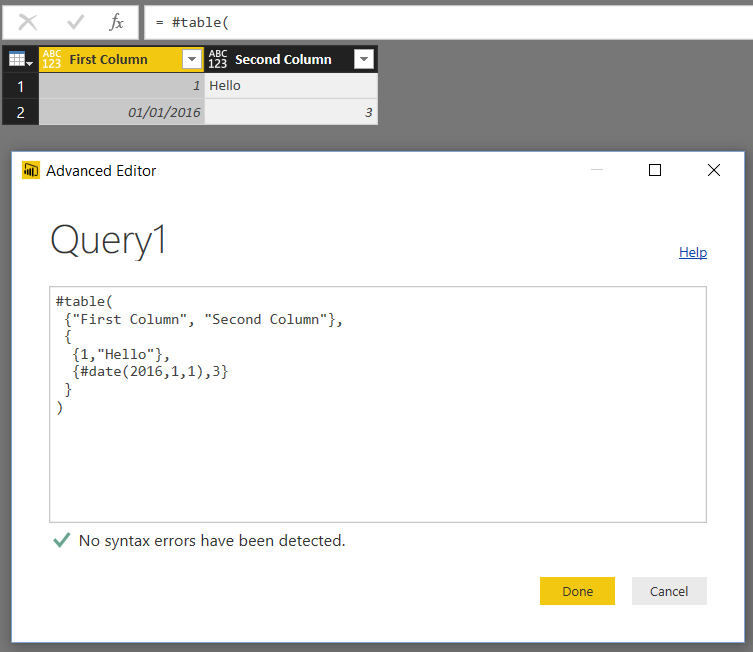 To do that you need to use this code in a query – the name of the query becomes the name of the table, and after you have loaded the output of the query to Power BI or Excel you can use it in a report. If I need to save the data generated by my charts and store it in table, can i use mquery to store historical data- so that upon refresh the historical table will keep growing when the model is refreshed daily? Yes, this is what the incremental refresh feature in either a published dataset or a dataflow to do this. Both require Power BI Premium though. There are some other workarounds using Excel but they aren’t reliable and I would not recommend them.